Dip-dyed denim, ombre chambray - no matter what you call 'em, these shirts are hot! Besides making a perfect warm weather cover up, chambray button ups are a great way to style traditional work wear, such as a printed pencil skirt (example). I bit the bullet last month and sprang for Heidi Merrick's dip-dyed denim La Paz shirt, and although I love it, I keep seeing budget friendly versions everywhere I turn! The closest match to the "gold" shirt at a fraction of the price would have to be this one - it's a men's so get it in a small or wear it oversized for a laid back look. 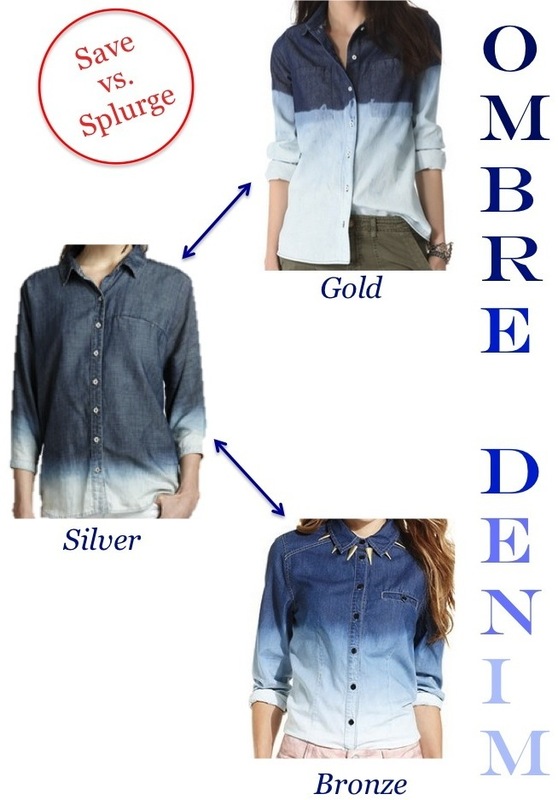 Anyways no matter what your budget allows, ombre chambray shirts are a trend that is sure to be worn if you indulge. I feel like this could be a really easy DIY, too! I probably shouldn't be trusted around bleach, but maybe someone could do it for me! I know, Alma! It's too late though :( oh well, lol. Strangely enough I like the 'bronze' one the best! I think that this is such a fun trend!